How To Grow Alfalfa Sprouts + Recipe ft Indigo Herbs* [VEGAN]. I'm am so far from being green fingered it's ridiculous, I can't even keep herbs alive. It's something that I honestly find a little upsetting really as I'd love to be able to grow and nurture my own food. 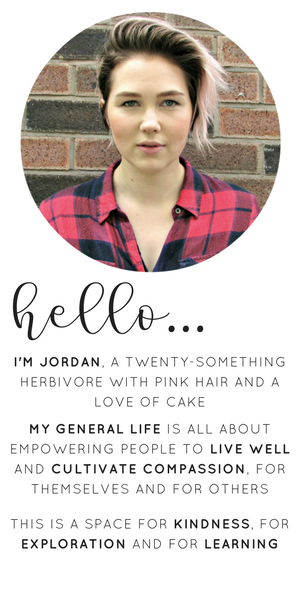 One of my goals this year is to teach myself how to be a bit more green fingered and at least grow something. So when Indigo Herbs sent me over some of their Organic Alfalfa Seeds I knew I had to try my hand at bringing them to life. And honestly, it was so easy even I could manage it without cocking it up. It's likely that you've got everything you need to start growing your alfalfa sprouts hanging about it your house somewhere. This being a mason jar, a muslin cloth and an elastic band/hair bobble. That is literally it. Alfalfa sprouts are packed with vitamins, the highest being vitamin K which is essential to support blood clotting along with promoting strong, healthy bones. 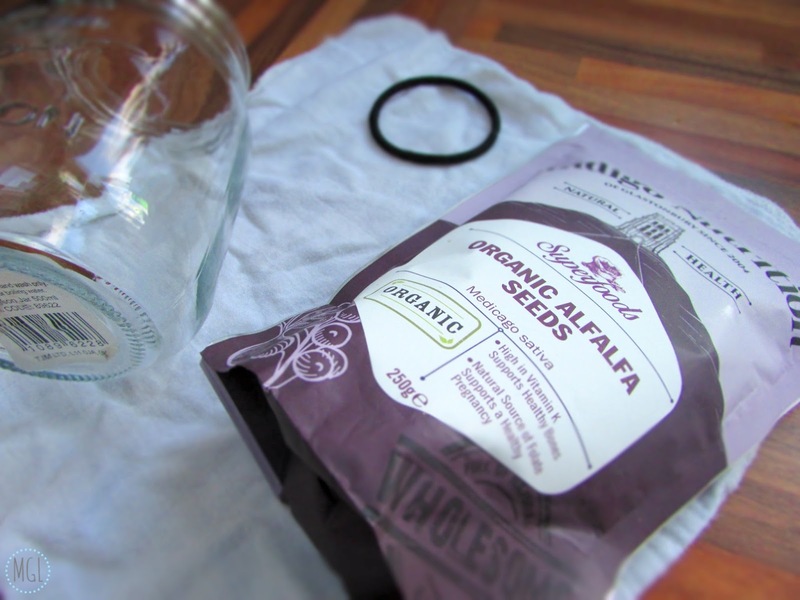 So to set up your sprouts you need to place 1 tbsp of your Organic Alfalfa Seed in the mason jar and cover them with a good couple of inches of water. Pop the cloth over, secure with the elastic band and leave to soak overnight. In the morning just drain the water off through the muslin cloth and leave the jar to sit somewhere - preferably not in direct sunlight. I gave my seeds a little rinse with fresh water every morning and evening after this, making sure to drain all the water off afterwards. What I think is so wonderful about growing alfalfa sprouts is that you can literally watch them grow - they change so quickly! Within just a few days you'll have a jar full of fresh, green sprouts ready to be enjoyed! See, even an inept gardener like me can manage growing sprouts. No mess, very little fuss and you reap the benefits within days. It was only after growing my sprouts that I wondered how I was actually going to use them. It's not hard to guess that they're pretty perfect in salads, as a little side, in sandwiches etc. But I wanted to try something a little different and non-traditional I guess. So I stuck them in a ramen and it was the best idea I've had all week. 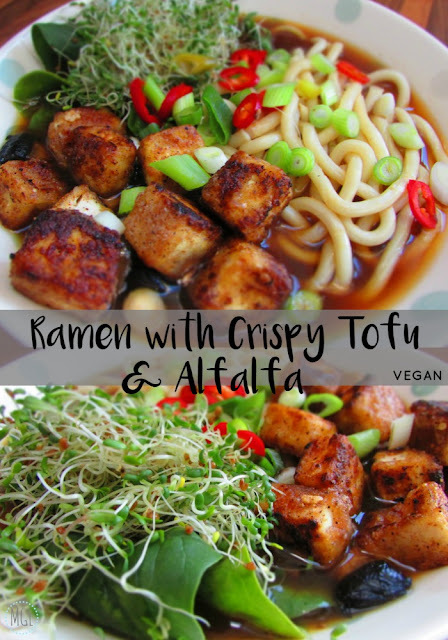 Honestly, it was so bloody yum and a great way to reap the benefits of the alfalfa sprouts. 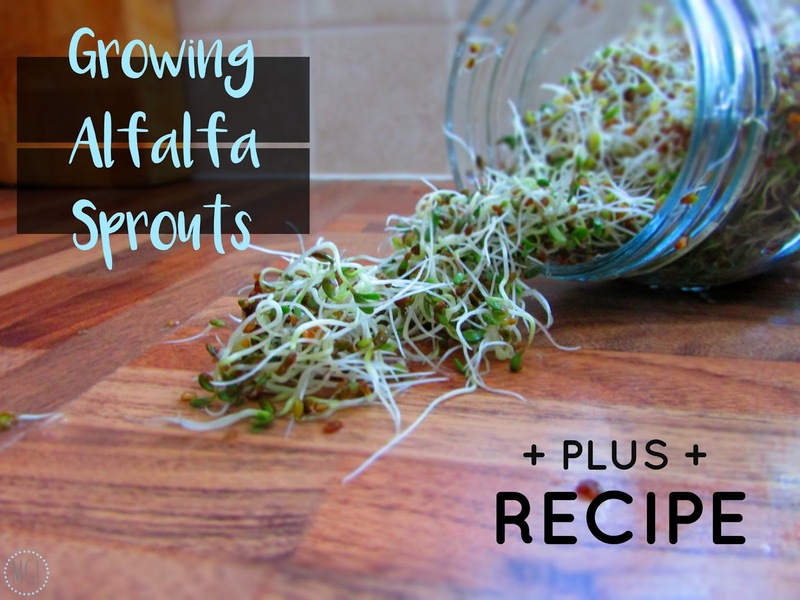 Alfalfa sprouts are believed to help reduce LDL (bad) cholesterol and increase HDL (good) cholesterol. ♥ Start with getting the broth stewing. Add the vegetable stock to a pan. Use a small amount of stock to loosen up the shiitake mushroom powder and add that to the pan too. Then add in all the other goodies (ginger, garlic, spring onion, chilli, soy sauce and rice wine vinegar). Allow the broth to simmer for around 30 minutes. ♥ In a shallow dish mix together the corn flour, Chinese 5 spice, cayenne pepper and salt/pepper (if using). Roll the tofu cubes about in it until they're coated on all sides. 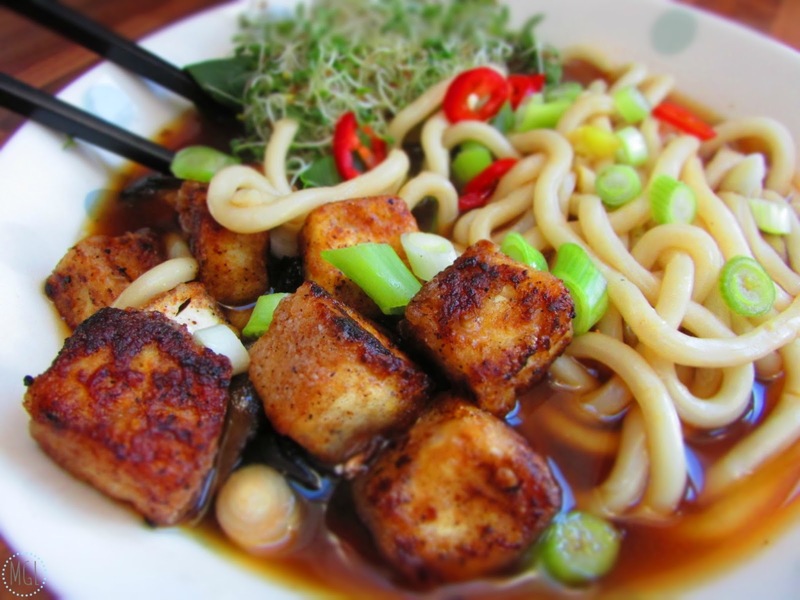 ♥ Heat the oil in a frying pan and when nice and hot place the floury tofu cubes in to fry. Keep turning as they turn all golden and crispy. ♥ While the tofu is cooking prepare your extras. Remove the chunks of garlic and ginger from the broth (you can leave them in if you want but I didn't fancy it) and the cook the noodles in the broth. I also fried off some mushrooms. ♥ Now it's time for the Avengers to assemble (metaphorically). Layer up the extras in your bowl of choice. Spinach, alfalfa, mushrooms, noodles and the freshly cooked crispy tofu. Add the hot, steamy broth over the top and sprinkle with spring onion and chilli to decorate along with a splash of soy if you wish. I wish I could eat this every damn day. I mean there's nothing stopping me but I would probably turn into a bowl of ramen. To me, ramen is just like a hug in a bowl. And it's definitely a dish you can throw together with whatever you have hanging around in the fridge and I totally encourage you to go wild and experiment with the extras. But for me it's a great way of getting my alfalfa in and packing in the extra nutrients. Studies have demonstrated that youngsters will probably eat the sustenance that they arranged.